KIEV, Ukraine -- Ukrainian prosecutors say that jailed former Prime Minister Yulia Tymoshenko will stand trial on tax evasion charges in a new case. Supporters of former Ukrainian Prime Minister Yulia Tymoshenko take part in a rally in Kiev, Ukraine, Wednesday, March 28, 2012. 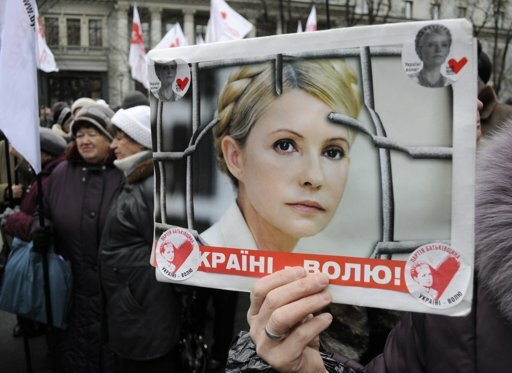 Tymoshenko, the country’s top opposition leader, is serving a seven-year prison term on charges of abuse of office in a trial condemned as politically motivated in the West. She has also been charged with evading tens of million hryvna (several million dollars) in taxes while heading an energy company in the mid-1990s. The Prosecutor General’s office spokesman Yuri Boichenko said Wednesday the tax evasion investigation has been completed and will be handed over to court within the next five days. He said the trial should start in a few weeks. Tymoshenko denies all the charges as an effort by President Viktor Yanukovych to bar a rival from politics.